Founded in 1984, Percept Limited, an entertainment, media and communications company, is at an enviable leadership position today, with a team of over 400 people and 32 offices in India and the Middle East and a capitalized billings of INR 9.35 billion (FY’18). Percept companies construct tailor-made content, assets and solutions that deliver in both local and international markets and services millions of clients and consumers across the globe. 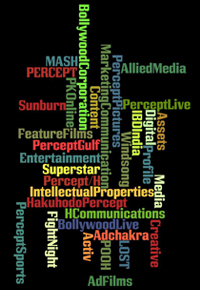 Percept Divisions & Companies deliver marketing solutions that reach consumers at every moment of their lives. From integrated advertising campaigns, to embedded content, to path-breaking live entertainment products, to innovative digital and media solutions; Percept companies construct tailor-made solutions that deliver in both local and global markets.